In 2018, the Royal Oak Foundation embarked on its appeal to raise $200,000 to help the National Trust complete a major, five-year restoration of its magnificent landscapes, monuments, temples and follies. Two donors are matching our appeal dollar-for-dollar – tripling the impact Royal Oak will make to bring Stowe back to its original splendor. Read on to learn more about Stowe’s rich history and the restoration projects that have been completed, as well as ones that are in the works. We hope it will entice you to make a gift and visit magnificent Stowe on your next trip to the United Kingdom. Stowe is an 18th-century landscaped garden and includes more than 40 historic temples and monuments. The National Trust acquired the gardens and parkland of Stowe, located in Buckinghamshire, in 1989 from the co-educational day and boarding school, Stowe School, that is housed in the original house rebuilt in the late 17th-century by Sir Richard Temple, the 3rd Baronet. The gardens were created by almost all the leading designers of the period including John Vanbrugh, James Leoni, William Kent, Charles Bridgeman and Capability Brown, and represents every phase of late 18th-century garden design. They are regarded as among the finest gardens in Europe and seen as the birthplace of the naturalistic landscape movement that influenced the design of major estates all over Europe and in Russia. The gardens’ importance lies in the quality and scale of the designed landscape, the innovative garden designs and its historical context. The Rotondo at Stowe, Buckinghamshire. Stowe is an 18th century landscape garden, featuring more than 40 historic temples and monuments. The principal gardens have survived in their late Georgian form, essentially without major alterations. The 250 acres of garden and surrounding 750 acres of parkland contain 40 Grade I temples and monuments. (Grade I is a United Kingdom historic structure designation that deems that a building or structure is of exceptional interest and may not be demolished or altered without permission from relevant government agencies.) This number is more than twice as many as any other English garden. In addition, Stowe boasts 100 designed vistas. As well as being a work of art of inestimable beauty and quality, the Stowe landscape evokes the beliefs and ambitions of the owners, the Temple-Grenville family, who were aligned with the aristocratic Whigs, the dominant political party in the 18th-century. The beliefs run through the garden design and architecture like a leitmotif, adding historical significance to the beauty of the monuments. Upon their 1989 acquisition, the National Trust began one of the most ambitious garden restoration programs it has ever undertaken. The first phase involved major landscape work, dredging of the lakes and restoring some of the most iconic out buildings such as the Temple of Concord and Victory. Phase Two started with the acquisition of the New Inn, a derelict Georgian farmhouse adjacent to the formal gardens, which provided lodging for the earliest visitors to Stowe 300 years ago. The building was restored and transformed into a new Visitor Center that opened in 2012, giving visitors the chance to see the original parlor rooms alongside new facilities. In 2016, the Visitor Center welcomed over 214,000 visitors. 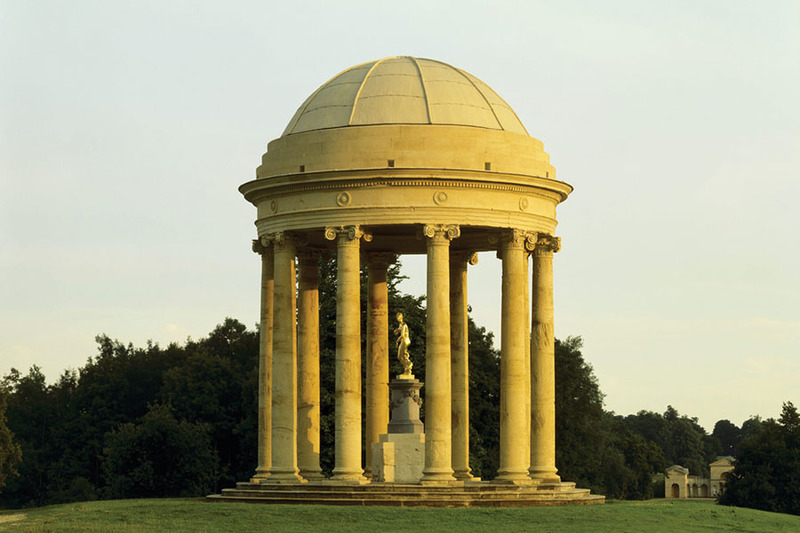 2015 saw the start of several new restoration phases of the Stowe gardens. Known as the “Stowe Landscape Legacy Programme,” this restoration is comprised of 54 tasks that would take place over a period of five years. The goal of this project is to reinstate many of the lost temples and monuments that once ‘dressed’ the gardens like pieces of a theater set, while also undertaking maintenance on the natural elements and lakes. Almost another third of the original garden will be rejuvenated and made accessible to the public, including the reinstatement of land currently used as a 9-hole golf course. To date, a majority of 45 of the tasks have been completed with the remaining nine to be undertaken in 2018 and 2019. These include the restoration and replanting of the Queens Theatre and the restoration of the Octagon Lake Cascade, as well as two reinstatements: The statue of Hercules and the Erymanthian Boar and, the largest project, the statuary group of Apollo and the Nine Muses. Other tasks include repairs of ironwork and stonemasonry of the Lamport Lodge Gates and Railings and the restoration of the Temple of Modern Virtue ruin. The entire restoration project will cost £2,560,000. The National Trust has contributed over half a million pounds from its reserved and restricted funds and an anonymous donor has pledged a challenge ‘match donation’ of £1,000,000. To date, total matching funds secured from legacies, charitable trusts and donations stands at £1,410,000. A balance of £150,000 is still needed in order to complete the final phase of the project. Royal Oak is pleased to partner with the National Trust on the final phase of this restoration project. Every dollar that Royal Oak raises brings the gardens and landscape of Stowe closer to its 18th-century glory.